Hi everyone. I have downloaded the both the 01.06.00 and 01.06.01 versions and tried to install with built in admin account as mentioned here. I have installed to 3 PCs with windows 8 x64, windows 7 x64, windows 7 x86 but in all of these the program crashed and said ".....has stopped working". Please could someone give me any advice? 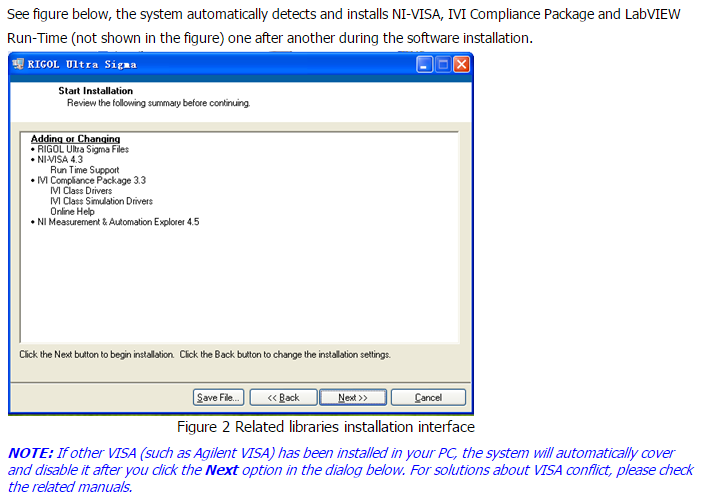 Did you also install the NI-VISA Virtual Instrument Software Architecture? It is mandatory for Ultra Sigma to function. Does it have an additional setup file? I think it have been installed with the ultra Sigma setup that I have downloaded from rigol site. I can't really remember, but you should have an entry "National Instruments Software" in your software list. If it's not there, please download and install from your mentioned link, and work up to version 15.5 of that through the updates. I have reinstalled the windows 8 x64 and ultra sigma. A screenshot is attached. Also I downloaded the National Instruments Software and installed it. But still it says "... has stopped working"
Did it already update to version 16.0 (which is the newest for me also)? You might want to force this through the Start Menu item "NI Update Service". Try changing the Regional Settings to a different country. Often the cause is just the "." vs "," for tge devimal separato. that's a good point...! But it makes no difference over here, all's working fine on ',' or '.' for the decimal separator. Then I'd suggest to just uninstall Ultra Sigma -maybe more thoroughly needed, ie folders/appdata/registry/etc- and reinstall that. Because it might be that you started off in the reverse order; NI-VISA maybe needs to be installed 1st. I think NI-VISA will be installed correctly. A working Ultra Sigma on W7 is attached. Right-clicking on the highlighted scope, and choosing Ultrascope will start Ultra Sigma then. So before starting with installation or usage of Rigol Software go to your Windows Control Panel and change the Region and Language settings to the right notation! Otherwise your software will not work properly." OK, here is the point: change the regional settings to USA And voila Thank you very much dagg and Bicurico! If Ultra Sigma crashes, you've checked " . " is your decimal separator, you've updated all the NI utilities... check if you need to set the "Ultra Sigma.exe" to run in windows 7 compatibility mode. That took me an entire bloody hour to work out. I'm sorry to drag this thread out of the mud but I thought another data point might be useful for future reference. I've struggled for two evenings getting NI VISA, Ultra Sigma, Python and PyVISA all set up on my new machine with Windows 10. Ultra Sigma kept crashing and I tried running as administrator, running in compatibillity mode, 01.06.01, 01.06.00, changed decimal separator etc. In the end I uninstalled everything, then I re-installed UltraSigma 01.06.01 and allowed IT to install whatever NI VISA version it comes bundled with (instead of installing the latest one) and it looks like this has rectified the issue for me. So, Ultra Sigma 01.06.01 with NI VISA 5.4.1 seems to work for me while the latest and greates NI-VISA 16 does not. No need for compatibillity mode, no need to run as administrator, no need to change decimal separator from "," to "."